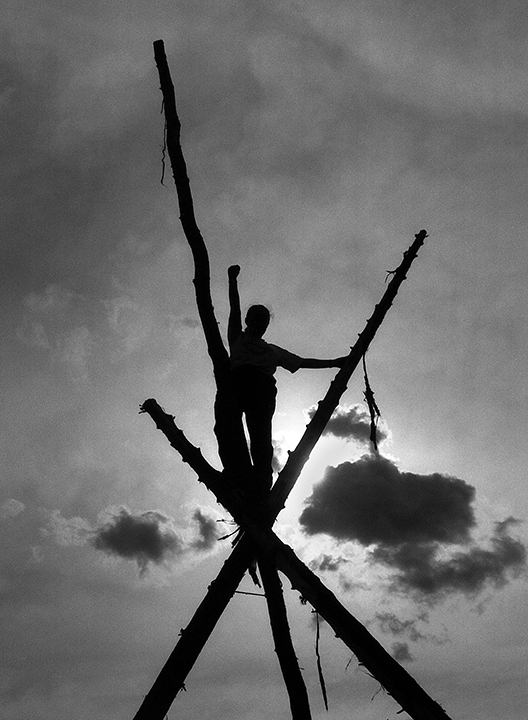 These Forest Activist Training Weeks took place over many years and hundreds of activists were trained in non-violent direct action, including blockading, banner making, climbing, tree-sitting, and tripod construction. Struggles for Justice: Forests, Land and Human Rights – Late 80s to Late 90s is dedicated to Judi Bari (7 November 1949- 2 March 1997). May 24th of this year will mark the 25th anniversary of the attempt to kill Bari when a pipe bomb exploded under the seat of her car. 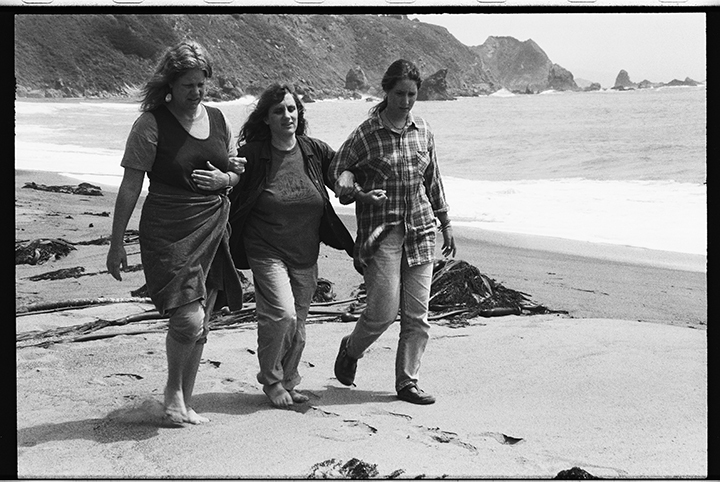 Bari maintained she was targeted due to her success in bringing environmentalists and mill workers together to protect the ancient redwoods. A photograph of Judi Bari is at the end of the exhibit portion of this posting along with a detailed caption. There is also a collage of her car after it was bombed. The following are photographic examples of the many campaigns and issues which Langelle was fortunate to be involved in and document. All of the photographs were shot with 35 mm Nikon Cameras using film. There are additional photos following this exhibit as an added feature. 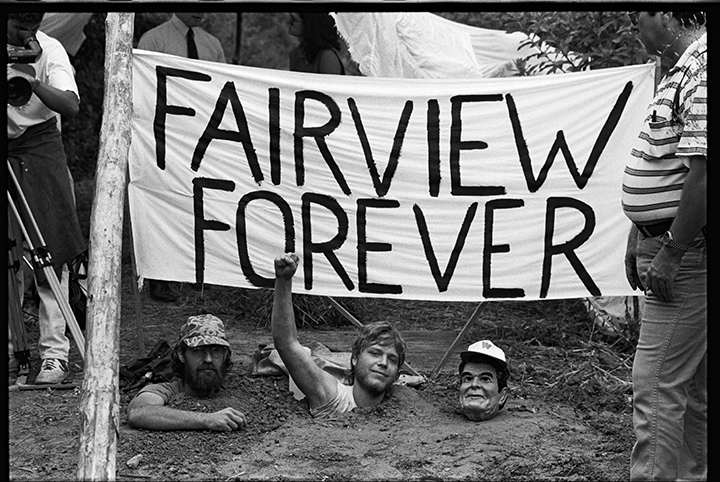 Earth First!ers (and Ronald Reagan) blockade the Fairview Timber Sale area in the Shawnee National Forest in southern IL by burying themselves up to their necks. Earth First! occupied the timber sale area for 79 days – at that time the longest occupation in EF! history. The area slated to be cut was rich in biodiversity, a haven for songbirds and loved by the many locals who went there to watch the birds, camp or enjoy nature. 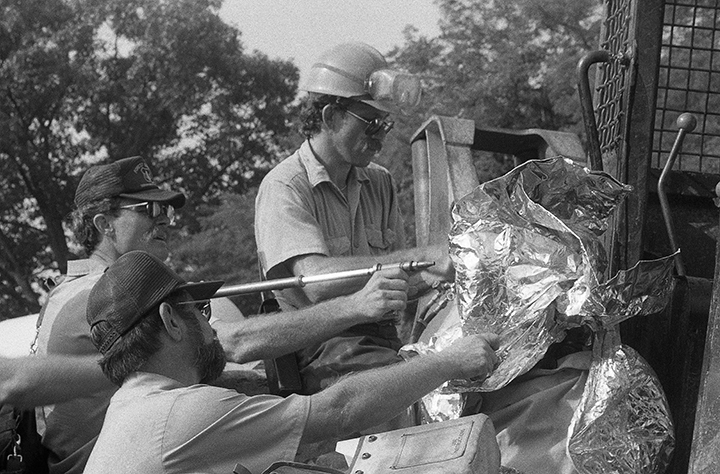 In the late 1980s, forest activists from Illinois and Missouri blockaded two entrances of Illinois’ Trail of Tears State Forest where active logging was taking place. The action made headlines in print, radio and television throughout the state and the public was outraged to learn that their state forests were being logged. Due to the public outcry spurred by the blockade, the logging was stopped. 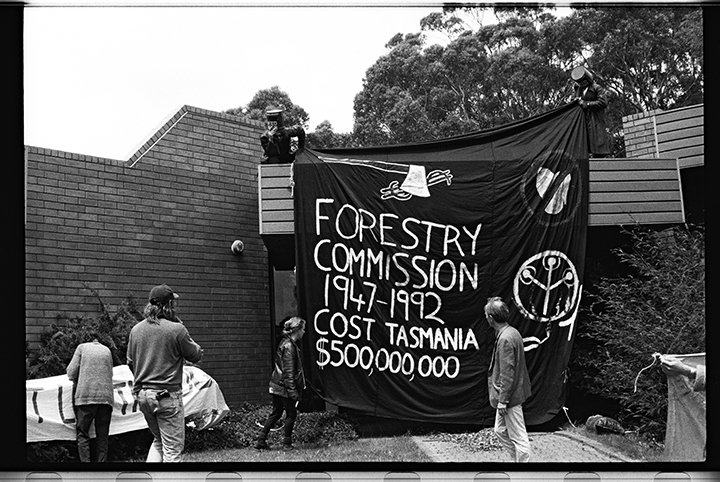 Office workers inside of the building fled and the entire Forestry Commission Tasmania was taken over by the demonstrators. After stopping all work that day, many of the protesters retired to a local working class pub. When the evening news came on, workers in the pub were upset about the protests and tensions began to flare. One of the protesters stood up from his bar stool and began singing the famous Industrial Workers of the World (IWW) song, “Hallelujah, I’m a Bum.” The workers knew the song, tensions abated, and the workers bought the protesters many rounds of beer as it was evident the protesters were not against workers, but against the exploitation of the workers, and the timber industry itself. This activist was arrested for handing out fliers urging the public to write their senators and congresspeople in opposition to the Kearsarge North timber sale in the White Mountain National Forest of NH. The arrest occurred in North Conway, NH, after a Northeast EF! Regional Rendezvous. 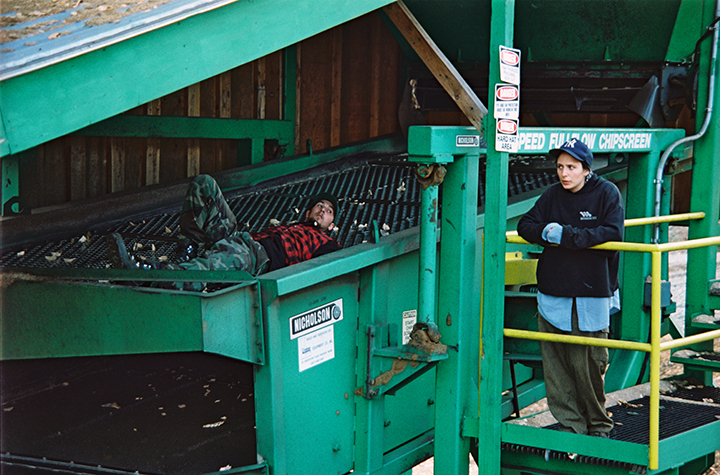 Activist locks down with a kryptonite lock onto R & J Chipping Enterprise’s wood chipping machine at the Maine – New Hampshire border after a Forest Activist Training Week in VT. Another protester offers support. The protester unlocked himself after employees threatened to remove the lock “with a sledgehammer.” The entire chip mill was shut down for the day. Earth First! 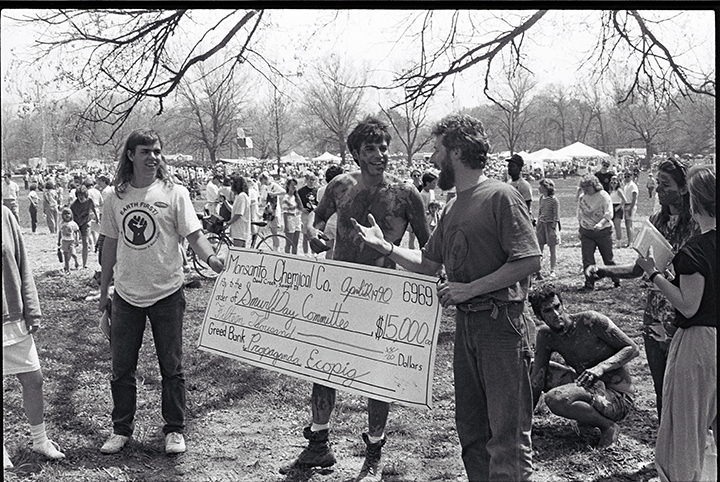 and “Mud People” present a check to the 1990 Earth Day Committee in St. Louis, Missouri. Monsanto was the main sponsor of the event. The action was the feature evening news story on a major television network affiliate in St. Louis with a reporter attempting to interview a mud person. An Earth First! “translator” fielded the reporter’s questions in English and then translated to the mud person in mud language; the mud person responded in mud language and then the Earth First! translator gave the answer to the reporter. The Abenaki never ceded their land to any state or federal government. They issued their own license plates, fishing and hunting permits, and demanded all Abenaki land be returned. Many were arrested numerous times for their actions. 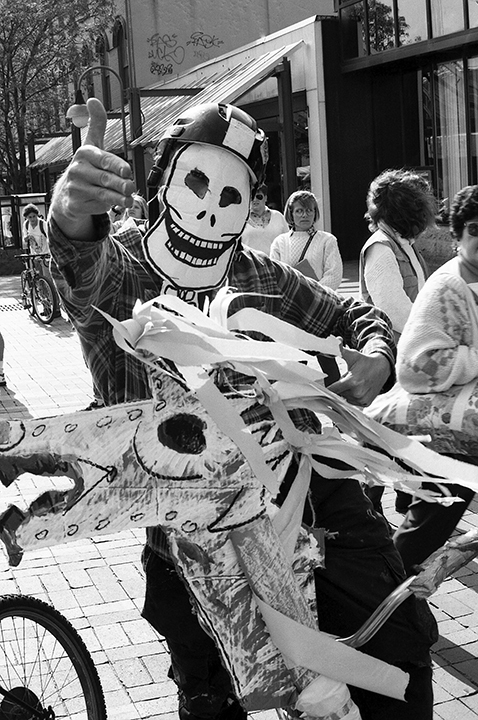 Demonstrator participates in a protest in Burlington, VT on 12 October 1992, the 500th anniversary of Columbus’ invasion of the Americas. 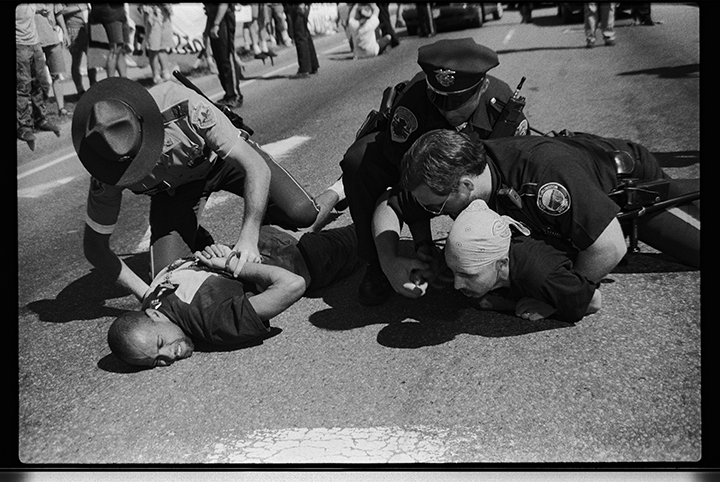 Earlier that day activists blockaded a major bridge across the Winooski River; there was one arrest. 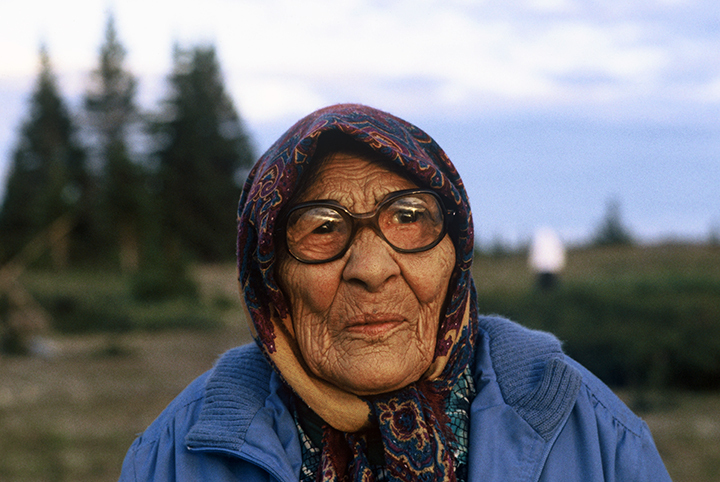 This photo was taken during a month-long documentary and fact-finding trip to the James and Hudson Bay regions of Northern Quebec, Canada. During the trip, Anne Petermann and Orin Langelle learned first-hand from the people who were involved in the day-to-day struggle against the multinational Hydro-Quebec exactly what the current situation was, both with the people already impacted by the nearly completed La Grande (Phase 1) Project and also with those fighting to stop Phase II, the Great Whale Project. Hydro-Quebec’s La Grande Project dam flooded thousands of hectares of Cree land, displacing all Cree in the area. An untimely water release from this dam drowned 10,000 migrating caribou. 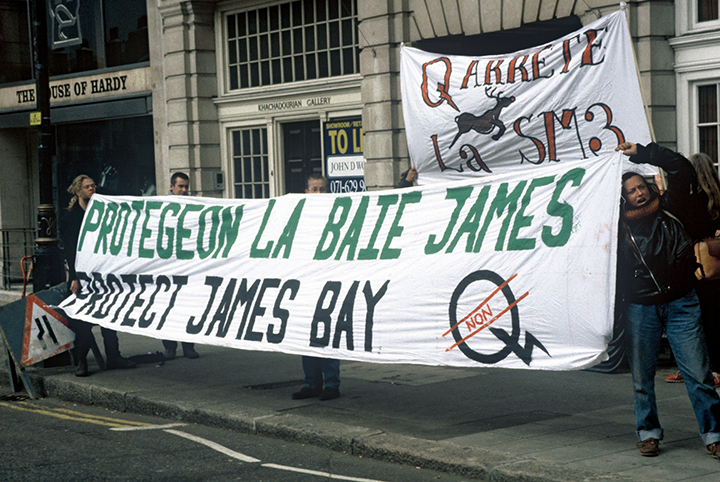 Activists in front of the Quebec Government Office (Consulate) in London, England hold a banner protesting Hydro-Quebec dams on Cree territory in Quebec. The Native Forest Network called for an International Day of Action on Hydro-Quebec’s 50th anniversary. There were over eighteen protests in six countries. After many years of First Nations’ intense resistance, and shortly after the global day of action, Hydro-Quebec put the Great Whale hydroelectric project “on ice” indefinitely. 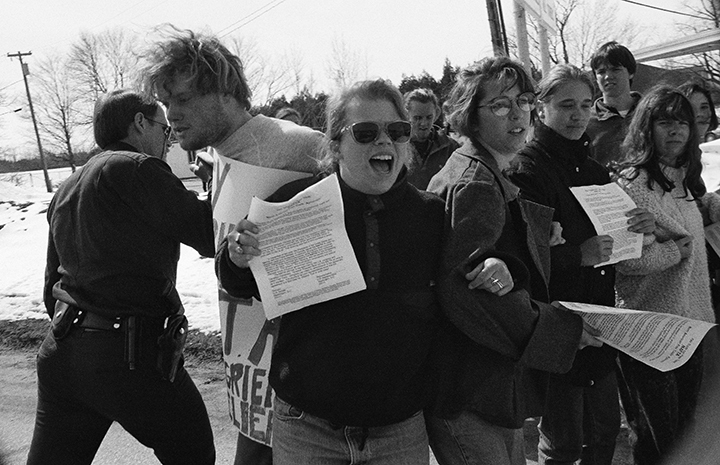 Protesters, mostly students, at the U.S.-Canada border near Swanton, VT attempt to blockade commercial traffic in opposition to the implementation of the North American Free Trade Agreement (NAFTA). Border Patrol guard (left) attempts to clear the border highway. On 1 January 1994, when NAFTA went into effect, Indigenous Peoples from Chiapas, Mexico, calling themselves the EZLN (Zapatista Army of National Liberation), held an uprising against NAFTA. They called NAFTA “a death sentence for the Indigenous Peoples of Mexico.” The uprising continues to this day. 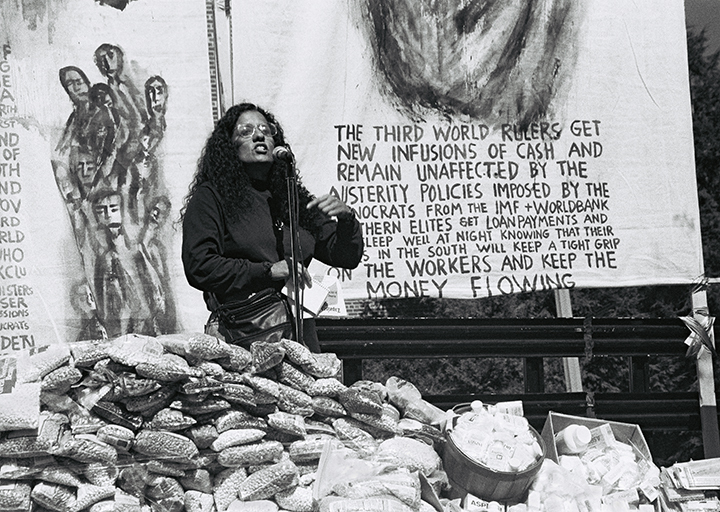 Cecilia Rodriguez, U.S. representative of the EZLN (Zapatista Army of National Liberation), speaks at a rally in Washington, DC protesting the World Bank’s 50th anniversary and Mexico President Zedillo’s visit to the U.S. In her speech she demanded suspension of U.S. military and technical assistance to Mexico for any purpose until human rights violations cease. While in southeastern Mexico two weeks later, Cecilia Rodriguez was brutally raped by Mexican paramilitary. 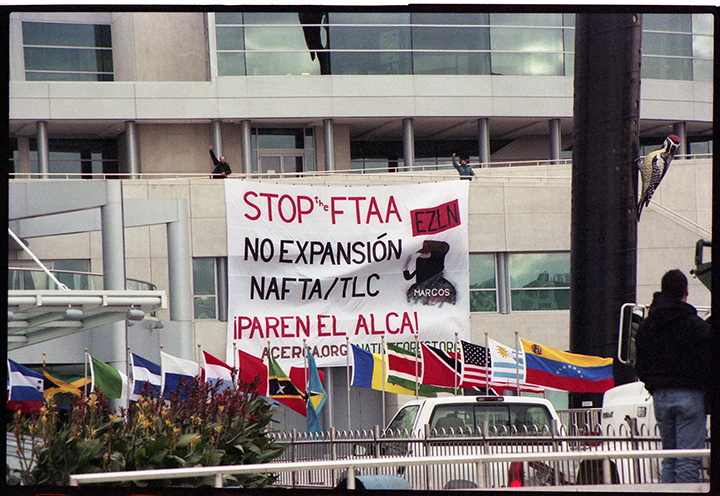 Activists hang 600 square foot banner on the Toronto Convention Center (Canada) where trade ministers from 34 countries had one of their first meetings to plan the Free Trade Area of the Americas. The FTAA was a new neoliberal trade agreement that would expand the North American Free Trade Agreement (NAFTA) from Alaska to Chile. Protesters hung the banner only a few weeks prior to the Battle of Seattle where 50,000 activists shut down the ministerial meeting of the World Trade Organization (WTO). One of the protesters called Toronto one of the first shots over the capitalist bow prior to the WTO meeting. Militant anti-globalization protests against the FTAA occurred in Windsor, Ontario; Quebec City; and in Miami. The FTAA was called off after the mass-protests in Miami in 2003. Today people are fighting the Trans-Pacific Partnership (TPP) Free Trade Agreement. The TPP involves the United States and eleven Pacific Rim nations – Australia, Brunei, Darussalam, Canada, Chile, Malaysia, Mexico, New Zealand, Peru, Singapore, Vietnam and Japan – who are negotiating yet another unjust trade deal. 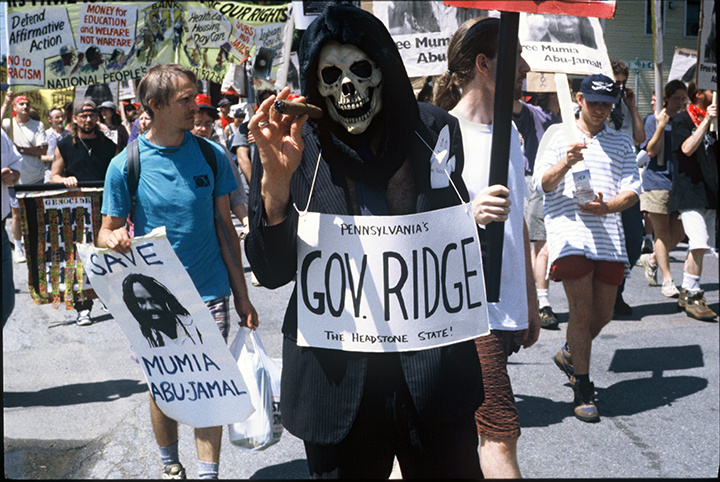 At the National Governors’ Association conference in Burlington, VT, hundreds gathered to protest the execution of Mumia Abu-Jamal, an award-winning journalist and political prisoner. Militant protests spanned five days. Pennsylvania’s then-Governor, Thomas Ridge, had ordered Jamal to be executed. 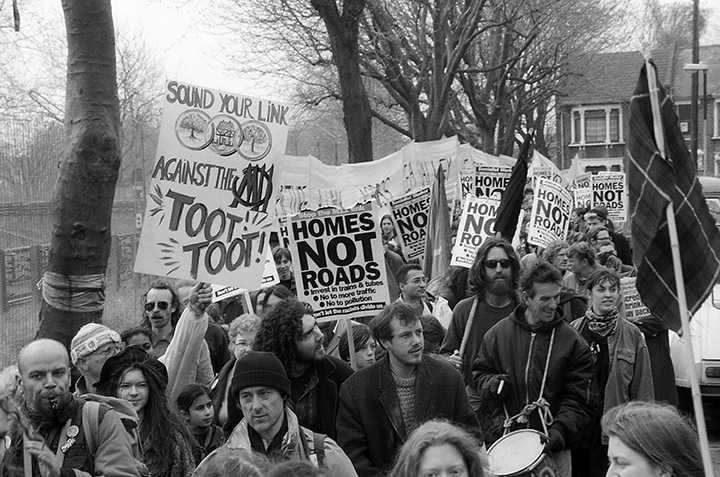 One of Britain’s largest and longest anti-road building protests took place in East London during the 1980s and 90s. 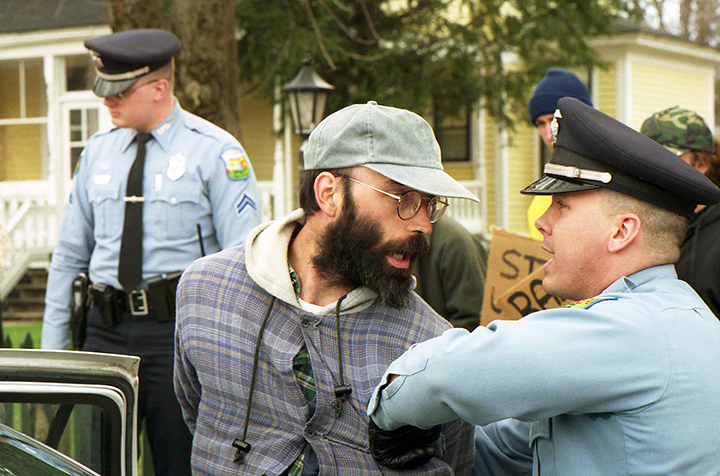 It came to a climax in 1993 when, after exhausting all other avenues, the campaign turned to direct action. The protest concerned the demolition of 400 houses in Leyton, Leytonstone and Wanstead to make way for an inner-city motorway. The new road was to link the M11, opened in the early 1970s, to London’s road network. This meant pushing the road through the Victorian terrace streets between Hackney marshes and Redbridge roundabout. The first Link Road Action Group was formed in 1976. For the next 15 years, the residents fought government plans through public enquiries. The residents’ solution was to build a road tunnel, leaving the houses untouched. By the 1980s, planning blight had affected the area and many of the houses had become home to a community of artists and squatters. Some were tenants of the housing co-operative ACME, which let derelict East End property to artists on short leases. 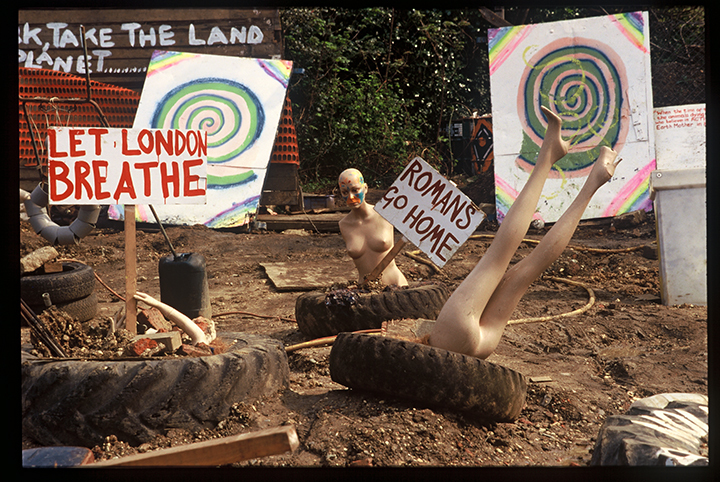 Construction of the road began in the early 1990s, followed in 1993 by the start of a direct action campaign to resist the final evictions. Residents transformed the Victorian terraces into a makeshift walled city, blocking up the entrances and creating new interior routes between the houses and over the rooftops. The streets became a daily battle of wills between the bailiffs, trying to evict people, and the inventive residents. The presence of so many artists created a visual protest. The houses themselves were turned into works of art, vividly decorated with slogans and banners. The protestors’ last bastion was Claremont Road, where the final evictions took place in December 1994. By this time, the protest had become an international news story and the world’s press and media witnessed the occasion. “Romans go home” refers to the first road builders in Britain: the Roman invaders. Dolly was born, survived two wars, and lived in this home all of her life. Her home was scheduled to be demolished for the motorway. She vowed to stay to the end. She was affectionately called “Dolly: Queen of the Street” by the anti-road protesters. 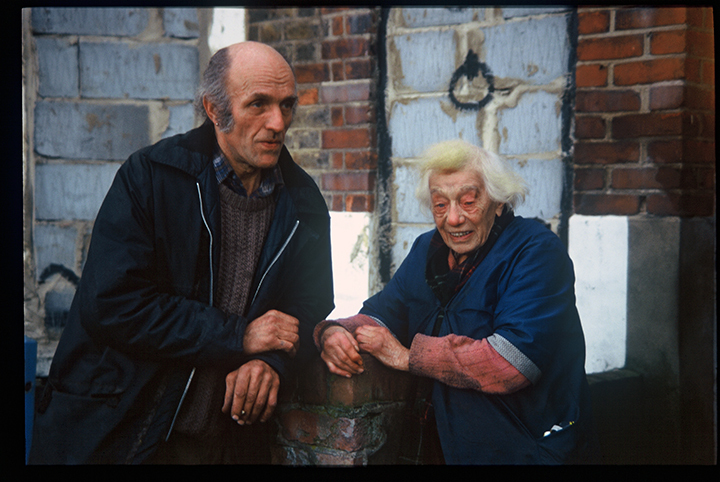 Watson said of the protesters, “they’re not dirty hippy squatters, they’re the grandchildren I never had.” The Department of Transport eventually came to evict her from her lifelong home. After a bitter struggle she was taken away to the hospital and placed in an ‘old people’s home,’ which she hated. She passed away soon after. The road was eventually built as planned, and opened to traffic in 1999, but the increased costs involved in management, and policing of protesters raised the profile of such anti-road campaigns in the United Kingdom, and contributed to several road projects being cancelled. Those involved in the protest moved on to oppose other such schemes in the country. McHenry co-founded Food Not Bombs in Boston with seven friends in 1980. He enjoyed his childhood living at the Grand Canyon, Yosemite, Shenandoah and several other National Parks. He studied painting at Boston University and started a graphic design company called Brushfire Graphics. McHenry lives with his partner and fellow Food Not Bombs activist, Abbi Samuels, in Santa Cruz, California and at their farm in Taos, New Mexico. He enjoys tending to their gardens, sharing meals with the hungry, maintaining their website and helping coordinate logistics for Food Not Bombs. He is an experienced public speaker and gives presentations at colleges and conferences all over the world. McHenry also draws, paints, and writes about social justice issues. Judi Bari was a North American environmentalist and labor leader, a feminist, and the principal organizer of Earth First! 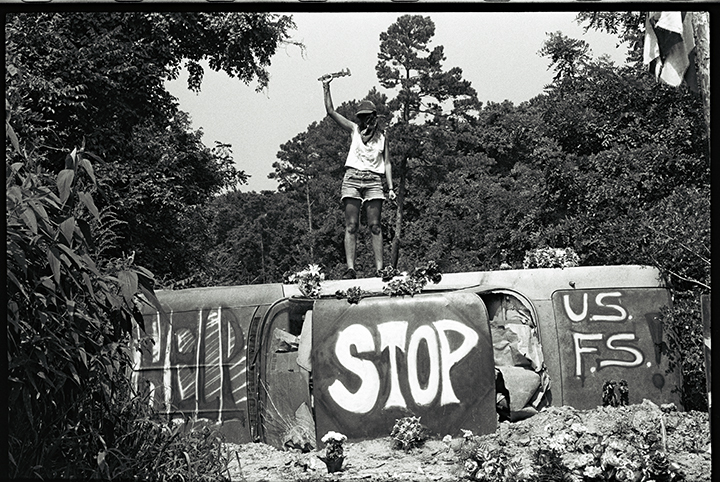 campaigns against logging in the ancient redwood forests of Northern California in the 1980s and ’90s. She also organized efforts through Earth First! – Industrial Workers of the World Local 1 to bring timber workers and environmentalists together in common cause. In 1986, Houston millionaire Charles Hurwitz acquired Pacific Lumber Company and doubled its rate of timber harvesting as a means of paying off the acquisition cost. This enraged environmentalists and drew attention from government agencies because of his use of junk bonds. 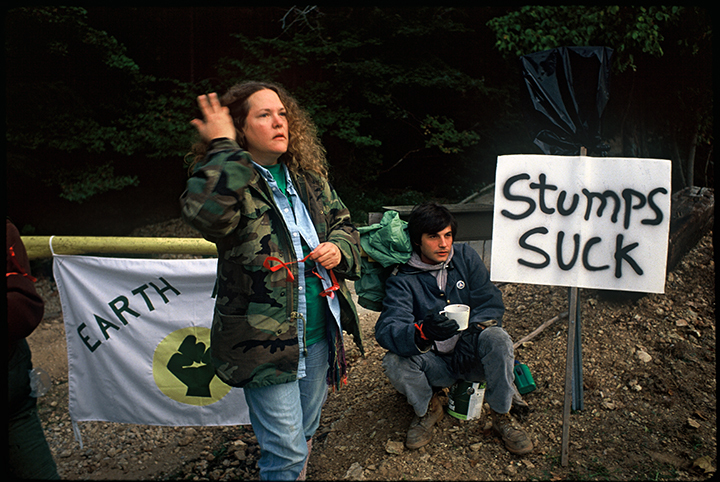 In 1989 Judi and other Earth First!ers came up with the idea of Redwood Summer, protests inspired by Freedom Summer, and by the Freedom Riders of the civil rights movement. Bari was instrumental in the process of calling in demonstrators from college campuses across the United States. Reactions to her lobbying tactics were severe, including the ramming of her car by a logging truck in 1989, as well as death threats. 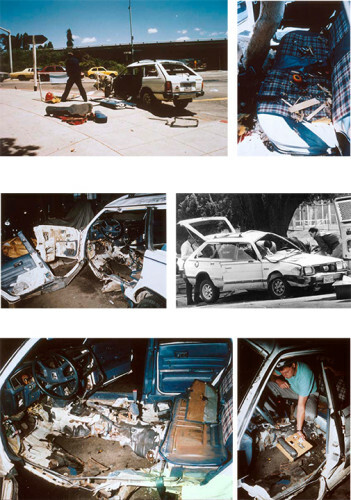 On 24 May 1990, in Oakland, California, the vehicle used by Bari and colleague Darryl Cherney was blown up by a pipe bomb under Bari’s seat. Bari was severely injured, but was arrested for transporting explosives while she was still in critical condition with a shattered pelvis and other major injuries. The FBI took jurisdiction of the case away from the Bureau of Alcohol, Tobacco, Firearms and Explosives, alleging it was an eco-terrorism case. Bari’s injuries disabled her to the extent that she had to curtail her activities. While she lay healing, Redwood Summer took place. In late July 1990, the Oakland district attorney declined to press charges against Bari and Cherney, claiming insufficient evidence. The false arrests and illegal search warrants became the basis of Bari’s civil rights suit filed the following year but not decided until 2002, five years after her death, when her estate was awarded $4 million in damages. Recently Mary Liz Thompson and Darryl Cherney produced the documentary Who bombed Judi Bari? Many emotions have flown in and out of my mind putting this exhibit together. Twenty-five years ago Judi Bari was bombed. Twenty-five years ago the longest Earth First! Blockade, at that time, took place. All of the photos in this exhibit, shot on film, bring back memories; too numerous to explain. And maybe too personal to express except for the photos themselves. 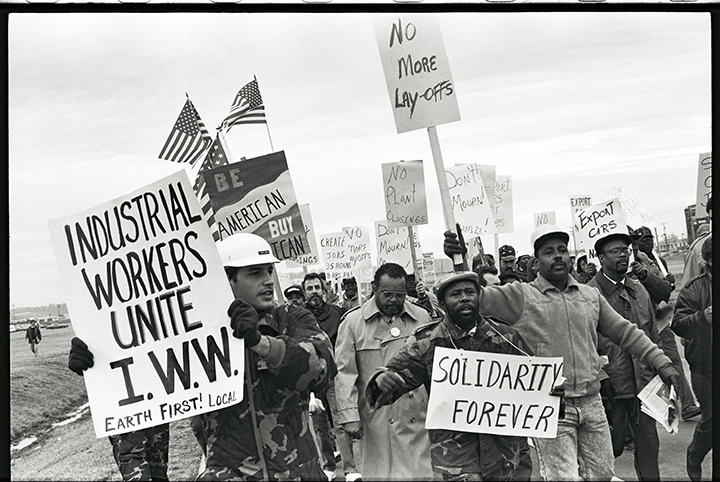 Many of the people portrayed in these photos put their personal safety at risk in the struggle for justice. While many of these struggles resulted in victory, I still wonder if the direction I took as a human and the chances I’ve taken really mattered. I guess I’ll never really know, but I know I didn’t, and couldn’t, stand with those who think they are powerful. The following photos were taken by Orin Langelle and originally published in a photo essay entitled Defending the Earth/Stopping Injustice. The above photos from the exhibit Struggles For Justice: Forests, Land and Human Rights – Late 80s to Late 90s were interspersed throughout that essay. Banner drop on three-story building where Ralston Purina shareholders were meeting in St. Louis, MO. Ralston at that time owned Chicken of the Sea tuna, and their boats were killing thousands of dolphins caught in their tuna fishing nets. The building was free-climbed by the activist above, using no ropes. Spurred by actions such as the above banner drop, environmentalists launched a nationwide consumer boycott of the three major tuna processors in the US: Heinz’ StarKist Tuna, Ralston Purina’s Chicken of the Sea and Pillsbury’s Bumble Bee Tuna. Together, these three companies controlled 70% of US tuna market. In 1990, after two years of concerted efforts by environmental groups, all three tuna processors agreed voluntarily to accept only “dolphin-safe” tuna, meaning tuna that was not caught by purse seine fishing or drift nets. In 1990, Congress enacted the Dolphin Protection Consumer Information Act (DPCIA), which established criteria for labeling canned tuna products as “dolphin safe.” To carry the label, tuna caught in the Eastern Tropical Pacific must have been caught on a trip during which no dolphins were encircled…Dolphin encirclement continues in the Eastern Tropical Pacific, but gear innovations, altered fishing methods, and international education efforts have reduced dolphin mortality in encirclement dramatically, by as much as 99 percent. This train derailed in Times Beach, MO two weeks before depleted uranium from Three Mile Island was scheduled to pass on those tracks. EF! 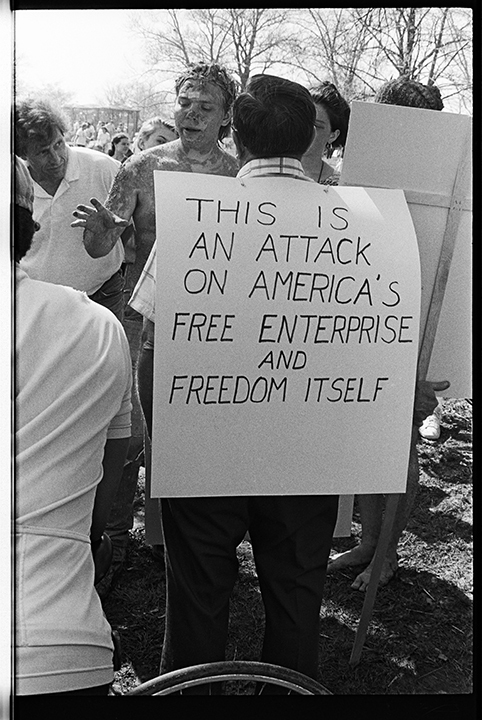 staged a protest during a fundraiser for then MO Senator John C. Danforth. Due to the action Danforth stopped the shipment. Big River Earth First!ers, calling themselves the “New James Gang” hung this banner next to I-44 outside of St. Louis, MO. “Forest 44” was the largest green area outside a major metropolitan city west of the Mississippi River and was scheduled for industrial and residential development. Forest 44, due to public outcry, still remains intact as the developers were kept out. The Abenaki never ceded their land to any state or federal government. 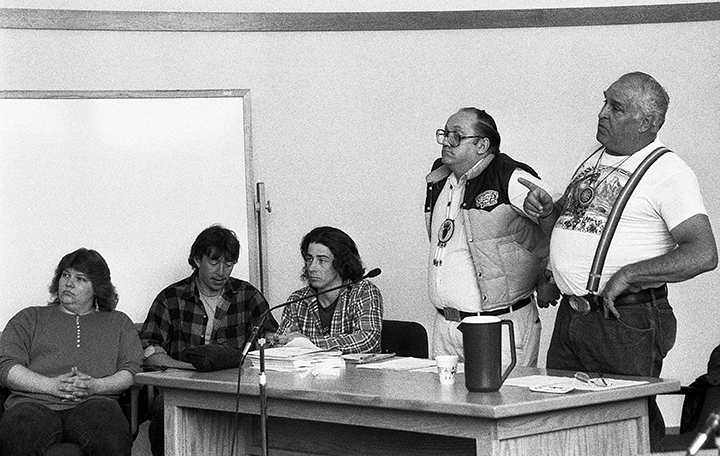 Because the Abenaki issued their own license plates, fishing and hunting permits, and demanded all Abenaki land be returned to the them, many were arrested and harassed numerous times for their actions. Winooski is the Abenaki word for “onion.” The Abenaki were going through intense legal trials in VT for their refusal to recognize the state of VT or the U.S. The Abenaki never ceded their land to the state or federal government. The Zapatistas condemned NAFTA (the North American Free Trade Agreement) as “a death sentence for the Indigenous Peoples of Mexico” due to many of its unjust provisions, but especially that which eliminated Article 27 of the Mexican Constitution. Article 27, which guaranteed the rights to communal ejido lands in Mexico, was an outcome of the revolution led by Emilano Zapata – after whom the Zapatistas took their name – in the early part of the 20th century. But in order for NAFTA – the free trade agreement between Canada, the US and Mexico – to be passed, Article 27 had to be eliminated. Its eradication was accomplished by Edward Krobacker, the Forestry Division Vice President and later CEO of International Paper. He intervened due to the fact that most of Mexico’s forests were on ejido lands, meaning they could not easily be obtained or controlled by multinational corporations such as IP. In June of 1995, the [Mexican] government received a letter from Edward Krobacker, of International Paper… establishing a series of conditions, some requiring changes in Mexico’s forestry law, to “create a more secure legal framework” for IP’s investment. According to La Jornada, all of Krobacker’s (original) demands were agreed to and new forestry legislation has been prepared. Upon returning from a Wall Street meeting with Henry Kissinger and other top financial celebrities, [then-Mexico President] Zedillo announced the rejection of proposed legislation that would have implemented the Zapatista accords. Instead he presented a counterproposal, designed to be unacceptable, which the Zapatistas rejected. Shortly thereafter, Environmental Minister Carabias announced a large World Bank loan for “forestry,” i.e. commercial plantations. Nicaragua’s east coast featured the largest intact tropical rainforest ecosystem north of the Amazon Basin. SOLCARSA (a South Korean multinational) began illegally cutting in the Bosawas on Indigenous Peoples’ territory in 1997. Fenicia was forcibly relocated to make room for the installation. Due to internal and international pressure, SOLCARSA was forced to shut down. At that time over 186,000 sq. kilometers of original forest were saved. Unfortunately illegal logging continues in the Bosawas and the reserve is being depleted of its biodiversity, threatening the lifeways of forest dwelling peoples. Langelle moved to Burlington, Vermont in the fall of 1991 and immediately became embroiled in ecological issues and Indigenous Rights struggles in the northeastern U.S.
Earth First!ers prepare “Champ”, the beloved Lake Champlain sea monster, for a funeral procession, claiming International Paper Company killed it with their discharges of dioxin into Lake Champlain. The protest received widespread media coverage in VT and upstate NY. International Paper countered by issuing a press release blaming EF! for causing a “spill” of over 250,000 gallons of untreated wastewater contaminated by dioxin the next day. EF! spokespeople explained to the media that EF! works to stop environmental catastrophes, not cause them. At a NY state environmental hearing to see if IP would be allowed to continue dumping dioxin into the lake, there was a person running around in a “Champ” suit, proclaiming “Champ Lives.” IP was allowed to continue business as usual. The action occurred after a Forest Activist Training Week in VT.
Cassini is an unmanned spacecraft sent to the planet Saturn. The Cassini rocket is powered by 72 pounds of plutonium — the most ever rocketed into space. Protesters pointed out that if the rocket exploded on takeoff, or crashed into the Earth, it could permanently irradiate the planet. Eleven people were arrested in Burlington, Vermont when they protested the Cassini launch by carrying 72 lbs. of cow manure into the office of U.S. Senator James Jeffords, a Republican. The protesters chained themselves by the neck to his desk with bike locks. The Burlington Fire Department had to cut the desk apart to remove the demonstrators. There were demonstrations across the U.S. including at Cape Canaveral, the launch site. Leading the march is Marsha Burnett, an activist and one of the longest survivors of HIV-AIDS at that time. In August of 1995, VT’s Department of Agriculture granted a permit to Boise Cascade paper company to aerially spray applications of Monsanto’s glyphosate-based herbicide “RoundUp” on their forestland. Champion International, then the largest landholder in VT, also wanted to spray the herbicide. The Eastern North American office of the Native Forest Network declared that chemical warfare has been declare on VT forests. Public forums were held throughout the state. The overwhelming majority of people were against the spraying. At one point, angry protesters disrupted the full body of the Forest Resources Advisory Council (FRAC). FRAC was appointed by Governor Howard Dean to make a recommendation on the spray or no spray decision. During the public forums, industry consistently said the herbicide was less harmful to humans than salt, coffee, or aspirins. They had clearly never read the warning label. After a long struggle that included direct action and organizing the public, Vermont was forced to declare a moratorium on the spraying. It became a de facto ban and Champion International and Boise Cascade sold their VT holdings and left the state. After an Earth First! northeast regional rendezvous, EF!ers, anarchists, and members of the Vermont Biotechnology Working Group stormed the ribbon-cutting dedication of the Stafford Center, the University of Vermont’s new biotechnology building. The “luminaries” who were outside consecrating the center were chased inside another building where the dedication finally took place, much to the chagrin of of the assembled dignitaries and government officials (including VT Senator Leahy and VT Lt. Gov. Snelling). The protesters did not leave and when the “in-exile benediction” ended, police had to link arms to provide the dignitaries and government officials an exit. The University of Vermont has a dark past when it comes to association with people trying to manipulate genetics. We have carried on for several years and what have we accomplished? It was good fun as long as we could afford it, but now it is a different matter. If Hitler succeeds in his wholesale sterilization, it will be a demonstration that will carry eugenics farther than a hundred Eugenics Societies could. If he makes a fiasco of it, it will set the movement back where a hundred eugenic societies can never resurrect it.